Diễn đàn > Góc Giảng Đường > Thư viện tài liệu > Sách Oxford Dictionary of Biochemistry and Molecular Biology. ah, các anh ơi, cho e hỏi tẹo, máy e chỉ mở đc file nén bằng Word thui, mấy loại file khác ko hỉu sao không mở được, có cách nào ko anh? 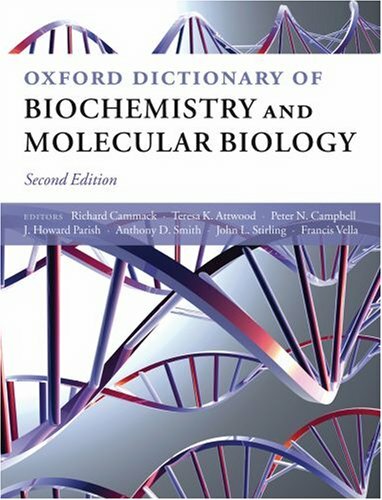 The Oxford Dictionary of Biochemistry and Molecular Biology provides a comprehensive survey of current biochemistry and molecular biology. Over the last few years, the language of Biochemistry and Molecular Biology has expanded enormously to the extent that few scientists can expect to be familiar with all aspects of it. This is partly due to the Genome projects and the successive -omics projects which have provided comprehensive information about genes, the functions of gene products, and cellular processes. At the same time, terms from other subject areas appear increasingly in the biochemical literature. The popular Dictionary has been comprehensively reviewed and updated to include many important new concepts and words. The entries are short but informative, providing up-to-date information on a broad range of topics, including definitions for selected terms from Bioinformatics, Biophysics, Cell Biology, Chemistry, Genetics, Immunology, Mathematics, Microbiology, Pharmacology, Systems Biology, and Toxicology. There are over 21,000 main entries, which give details of biochemical substances and the processes in which they are involved, define methods and concepts in molecular biology, and give definitions of biochemical symbols and abbreviations. It points out pitfalls where terms are often confused. It explains the precise syntax of biochemical terms, such as Greek letters and other formatting, which are lost when searching the Internet. In addition the dictionary is illustrated with over 900 chemical structures. The Oxford Dictionary of Biochemistry and Molecular Biology will serve as an invaluable reference for biochemists and molecular biologists seeking information outside their own fields, and for those wishing to revisit fundamental principles. máy e chỉ mở đc file nén bằng Word thui, mấy loại file khác ko hỉu sao không mở được, có cách nào ko anh? Em cài phần mềm Teamview đi. Links download tại đây. Sau khi em cài xong thì gửi cho anh Partner ID., sau đó gửi cho anh Pass. Anh sẽ xem và cố gắng giúp. pruedence nguyen thích điều này. bạn ơi, có thể cho mình xin link fshare của file này ko. mấy cái link kia die cả rồi.